When Antonioni began filming Red Desert it was clear he had a grand vision for his shift into colour. “I want to paint the film as one paints the canvas,” he said. “I want to invent the colour relationships, and not limit myself to photographing only natural colours.” Created under the working title Celeste e Verde (or Sky Blue and Green) it was this bold colour scheme, among other things, that would ultimately lead the picture to win the Golden Lion at the 1965 Venice Film Festival. Set against the eerie industrial wastelands around Ravenna, northern Italy, Antonioni ensured a canvas almost as stark as the black and white films of his past, lingering heavily on the lines of the factory metal frameworks, the greys and aluminum hues, with everything shielded by plumes of factory smog. 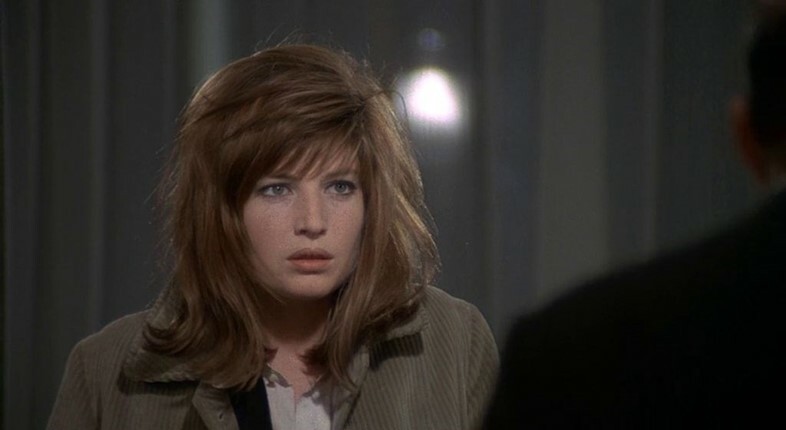 In this desolate landscape his lover and muse Monica Vitti plays Giuliana, a woman struggling to recover from a traumatic car accident, who begins an affair with an associate of her engineer husband (Richard Harris). 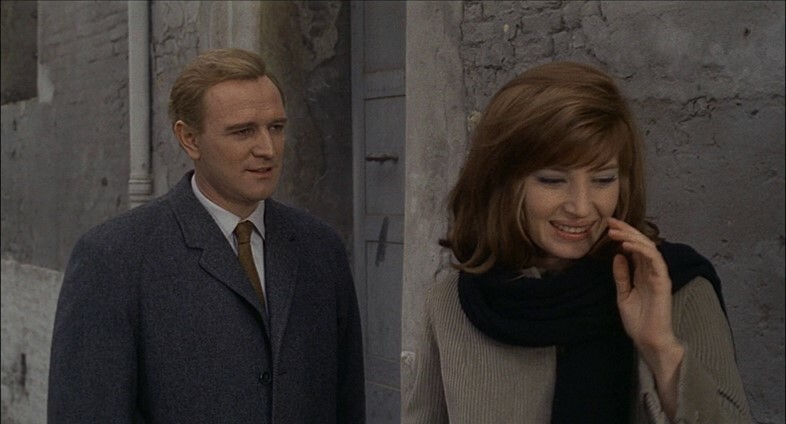 Giuliana captivates throughout the film, and Antonioni’s camera lingers on her often. Despite her emotional upset, her wardrobe rarely reveals her inner dishevelled state. With bright colours, tailored details and a crop of fiery red hair, she becomes a central beacon for the direction of the story as a whole. We take a closer look at the central components of her on-screen style. If there’s one motif that underpins this film, it’s footwear. Vitti wears kitten heels religiously thoughout, in various shades. One particularly memorable scene shows a newspaper caught under her shoe; as it blows up in the wind she untangles it from her burgundy heels, allowing Antonioni to pan the camera back up. It’s a deft move, which neatly illustrates that style should stretch from head to toe, no matter what the world throws at you. Antonioni’s affection for colour is perhaps best played out in the palate of Giuliana’s wardrobe, but we’re particular fans of her outerwear. Her first entrance on the factory floor sees her stand out immediately in a vivid green button-down coat; in many ways she first appears as a verdant symbol of the nature missing from the manmade landscape. As the film goes on it becomes clear she has a coat for every occasion; she’s clad in a sheepskin-lined overcoat one moment and a boxy camel-coloured one the next. She proves that a good coat can pull an outfit together like nothing else. Moving away from her natural blonde, Vitti appears in the film with vivid auburn hair, just one of the many references to the “rosso” of the film’s title. The intense colour instantly sets her apart from previous roles. Her tousled fringe and loose waves frame her face with a gentle grace, and when relaxed she runs her hands though her bobbed hair with a striking sensuality; when distressed, however, she cries that her hair “hurts”, and grabs at her locks with abandon. In both cases Vitti’s unkempt tresses provide the perfect means by which to play her emotions. In one of the quieter and more poignant scenes at the start of the film we see Vitti at her most vulnerable with her husband, heading to bed. Clothed in a white lace shawl and a cotton nightdress, she becomes an image of innocent fragility, her pale limbs curling away from her husband as he attempts to comfort her. He co-ordinates with her, donning a similar button-down pyjama set, yet the couple’s clothing reveals a deeper problem: although the two are trying to match up, it’s clear they’re emotionally out of sync. While scrutinising colour swatches on the bare walls of her new shop, Giuliana declares that “light blue would be best”. While she may crave cold and uninvasive colours, it’s clear that what her life needs is more vibrancy. As its title suggests, colour plays a key role throughout this film – and it’s no accident that the liveliest scene occurs when the characters are locked in a small red-walled cabin. Giuliana’s wardrobe pays homage to the power of colour in all its simplicity.